Initial deliveries to Israel of the McDonnel Douglas F-15 got under way on December 1976 when four Category II, Full-scale Development (FSD) aircrafr were accepted under Operation Peace Fox I. Bearing serial numbers 72-0116 through 72-0118 and 72-0120, the fighters had been updated to full F-15A standard but still retained the smaller speed brakes. The first group of Israeli crews received their training from the 58th Tactical Training Wing at Luke AFB, Arizona, and became the nucleus of the first eagle unit to be operated by the Israeli Defense Force/Air Force(IDF/AF) or Heyl Ha'avir. This was No. 133 Squadron a Tel Nof AB. 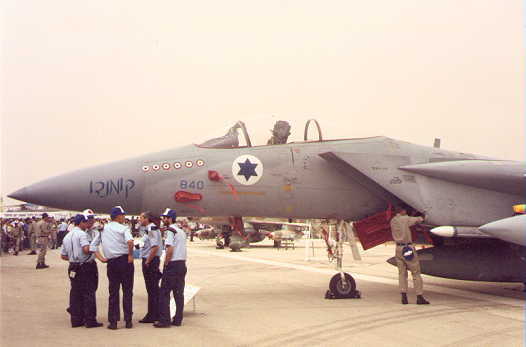 The Baz (Eagle), as it is called in Israeli service, did not become operational with the unit until 1978, by which time a production order of 10 Block 17 jets and two Block 16 F-15B had been delivered. The single-seat models were assigned IDF/AF 600 series serials, whereas both twin-seater were given IDF/AF 700-series number.Pressed into operational service immediately, the squadron flew combat air patrol (CAP) during March 1978, as cover for Israeli Forces engaged in Operation Litani in southern Lebanon. Although not called upon to engage enemy aircraft at that time, the Baz scored its first air-to-air victory little over a year later during an attack on Palestine Liberation Organization (PLO) targets in the region. In that operation, a flight intercepted and shot down four Syrian Mig-21 on 27 June 1979. By the end o the following year, the squadron had scored another seven "kills". Success against a more advanced Syrian fighter came on 13 February 1981, when a MiG-25 "Foxbat" was shot down by the commanding officer of No. 133 Squadron, using a radar-guided AIM-7F Sparrow. A second MiG-25 was destroyed on 29 July of that same year. 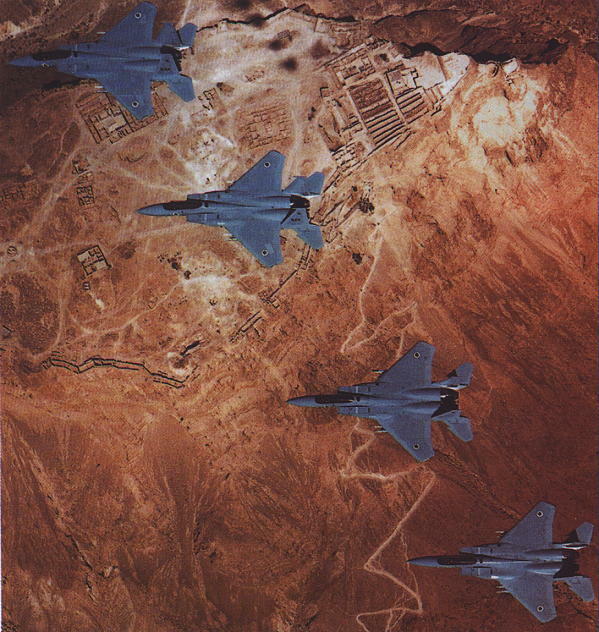 The now famous raid on Iraq's Osirak nuclear acility on 7 June 1981, saw the squadron's F-15As fly top cover for attacking F-16A Fighting Falcons. Baz fighters got airborne from Etzion AB in the southern part of the country at 15:55 hours but did not penetrate Iraqui air space. Instead, they stayed in hte ai ready to intercede if the F-16s were challenged by enemy interceptors. Others remained on alert after the raid in case Iraq attempted a retaliatory strike. As a result of these air battles, many Eagles now carry 2, 3,or even 4 miniature Syrian roundels as kill markings under the cockpit. In 1988 the F-15s were subjected to the USAF Multi-stage Improvement Program ( MSIP ). This involved replacing the APG-63 radar with APG-70, fitting improved digital central computers and CRT cockpit display and the installation of the 220 engines. Squadron 133 was put on full alert following the Iraqi invasion of Kuwait on August 2,1990. Continuous Combat Air Patrols were flown by the time the UN deadline expired on January 15, 1991. However the Iraqi Air Force declined to fight and the Eagles could do nothing about the Scud missiles, so the continuous Caps were discontinued by February 12. The total Eagles in the squadron by this time amounted to 40.